VERSA TRAILER ROOF CARGO BOX MOUNTED ON THE VERSA TRAILER CARRY 400 LBS. IN THE CARGO BOX AND 600 LBS. MORE ON THE TRAILER. 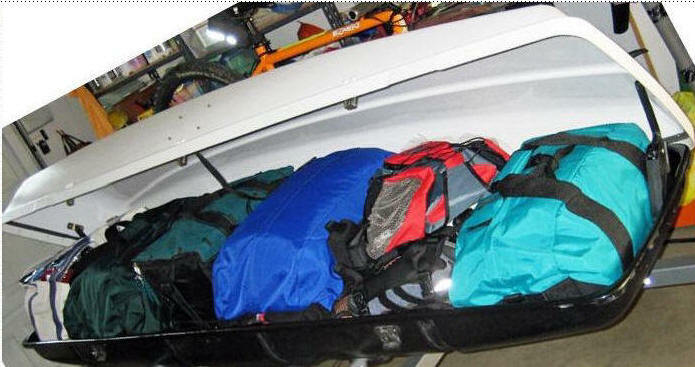 PLENTY OF ROOM FOR BIKES, SKIS, TOBOGGANS, FISHING AND HUNTING EQUIPMENT, EVEN CARRY CANOE / KAYAK ABOVE. 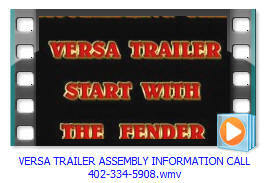 VERSA TRAILER HAS A TRAILING TORSION AXLE AND IS GENTLE ON THE GEAR YOU CARRY. IT RIDES SMOTHLY DOWN THE ROAD WITH NO BOUNCE OR SWAY. 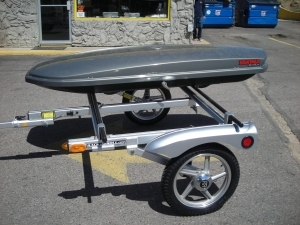 OVER THE YEARS WE BUILT LOTS OF VERSA TRAILER JR. TRAILERS USING CARGO BOXES. WE HAVE EVEN BUILT CUSTOM BOXES. TO CUSTOMERS SPECIFICATIONS. 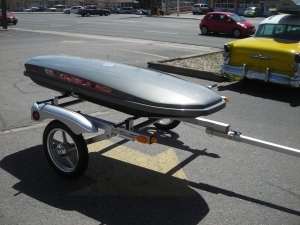 VERSA TRAILER ULTRA LIGHT VULB42 TRAILER. LARGER THAN THE COMPETITION AT 2/3 THE PRICE. 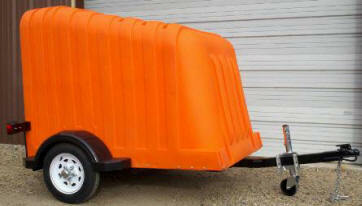 CARGO SMART BOX ON A VERSA 2K GALVANIZED TRAILER WITH 4 X 6 FT. FLOOR TO MOUNT THE ROOF CARGO BOX ON. 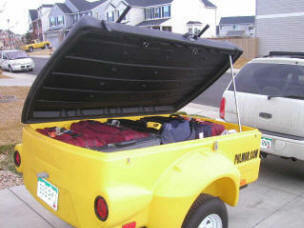 THULE BOX ON A YAKIMA TRAILER WITH A CROSSBAR RACK TO MOUNT THE ROOF CARGO BOX ON. 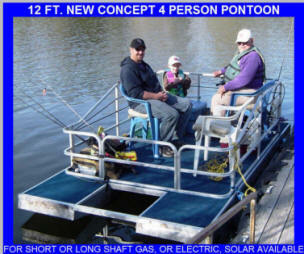 PRICE IS ABOUT $3,000.00 300 LB. CAPACITY. NOTE IT THROWS ROAD GRIME FROM FENDERS. 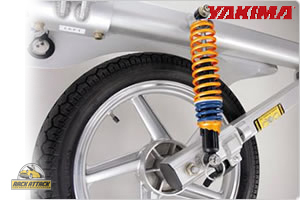 The Yakima Trailer Heavy Duty Shocks increase your trailer load rating up to 300 lbs. 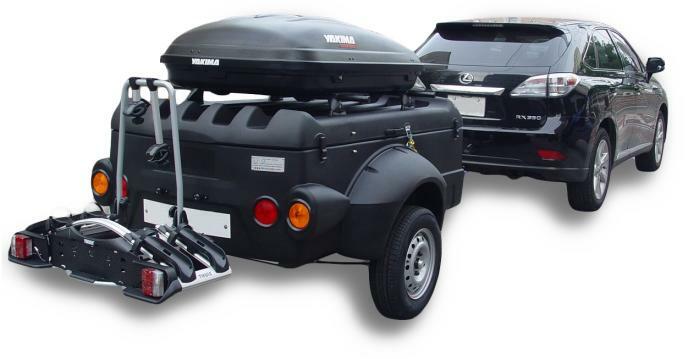 The Yakima Heavy Duty Shocks only work with both the Yakima 78" trailer. 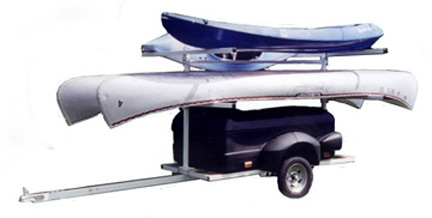 Trailers are a nice alternative to roof racks with roof rack style load bars that can haul all your gear including kayaks, canoes, sailboats, storage boxes, and bicycles. 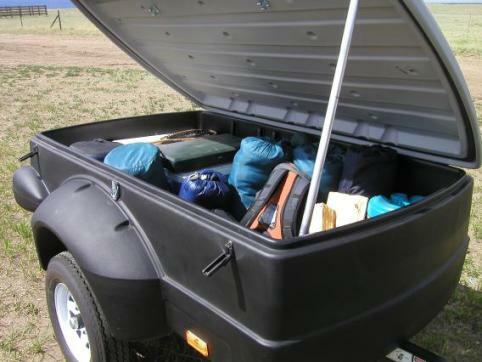 Unlike a roof rack, trailers carry your gear where you can reach it. THE TRAILER ON THE LEFT HAS A NET CAPACITY OF ABOUT 160 LB. 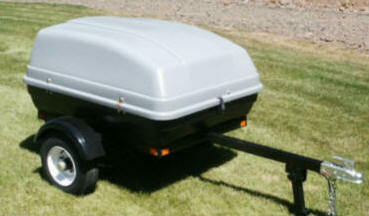 WITH THE CARGO SMART BOX ON A VERSA 2K GALVANIZED TRAILER WITH 4 X 6 FT. FLOOR WITH ROOF CARGO BOX ON. 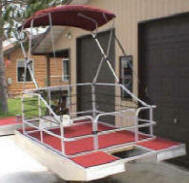 SAVE ABOUT $1200.00 PRICE IS ABOUT $1.729.00 CAPACITY 1000 LB. IF YOU A HEADING OUT FOR A LONG TRIP TRUST OUR TRAILER TO MAKE IT ROUND TRIP WITH NO PROBLEMS. WE USE THE BEST TORSION RUBBER RIDE SUSPENSION! 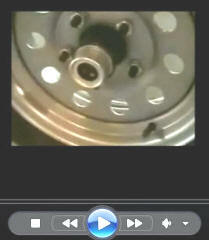 WE USE THE BEST LUBRICATION HUBS AVAILABLE! LOOK AT THE STANDARD FEATURES THAT OTHERS CHARGE HUNDREDS MORE FOR! TORSION RUBBER RIDE SUSPENSION. WATCH THE 20 SECOND MOVIE ON LUBING THE HUBS. OUR FEATURES ARE BUILT IN, NOT ADDED ON! OUR NEW LOW PROFILE MODELS FEATURE ABOVE TORSION AXLE WITH EZ LUBE HUBS, WITH A ALL WELDED FRAME, WELDED TONGUE, AND STEEL HARDENED COUPLER. ORDER THE BOX OR RACK OR A TRAILER OR TRAILER PACKAGE AND PICK IT UP AT OUR LOCAL DEALERS OR HAVE IT DELIVERED TO YOU HOME OR OFFICE. IF YOU NEED A LOT OF CARRYING SPACE IN A LOW PROFILE UNIT, CONSIDER OUR PULMOR ! WEIGHT ONLY 345 LBS. ADD A CARGO BOX OR A ROOF RACK. THE PULMOR TRAILER IS POPULAR WORLDWIDE ! 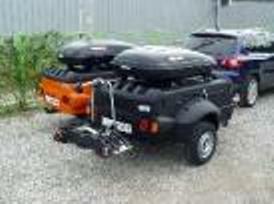 pulmor sport trailer with cargo box on cargo rack WITH REAR RECEIVER ACCESSORY MOUNT.